Some comments on Klimov’s VPK article . . . . In his short opinion piece, Klimov doesn’t systematically address the cost-benefit of Russia’s nuclear-powered submarine forces. But he has an opinion: their price outweighs their usefulness. He’s not happy with what little he’s seen from the Borey and Bulava programs, but he seems to favor keeping a naval component in Russia’s strategic nuclear triad. He’s not persuaded when it comes to SSNs. Klimov states flatly that Moscow’s effort to modernize its third-generation attack boats has failed and it has turned instead to project 885/885M. But these fourth-generation subs are too expensive and too few in number. Producing them as an effective means of non-nuclear deterrence, Klimov writes, is beyond Russia’s economic capabilities. While the 885/885M design might approach U.S. levels of stealthiness, they aren’t rolling out of Sevmash like sausages. Not even commissioned, Kazan will make two. Yes, two. The U.S. Navy has had three Seawolf-class SSNs since 2005. It has 16 Virginia-class subs in service. Another is ready for commissioning. Nine, yes, nine are under construction. Ten Block V boats could be built in the 2020s. And the U.S. Navy also maintains a capable force of more than 30 Los Angeles-class boats. It has to. It confronts larger, more complex strategic challenges than its Russian counterpart. From outside, we can only guess whether USN airborne ASW is as successful as Klimov claims. One would expect the FSB to inquire about his sources for this part of his story. Mind you, he was talking about P-3 Orion surveillance, not more modern and capable P-8 Poseidon aircraft. That older combat systems have been used on the 885/885M, as he asserts, seems likely from past Soviet/Russian evolutionary practice. Klimov’s recommendations, however, are more difficult to swallow. Redistributing resources from SSNs, which are becoming dolgostroi, to ground forces, surface ships, and naval aviation would be strange. Spending less on subs in favor of the army could be a legitimate decision for Moscow to make, especially because the navy made out so well in GPV 2011-2020. But it also sounds like something green-uniformed guys in the General Staff might propose. It makes one wonder whether Klimov’s article was commissioned (by someone wearing green). Proposing that money saved go to surface ships and aviation is puzzling. Sending more rubles down the surface ship “rabbit hole” is unlikely to produce better results. The Russian Navy has always been a submarine navy, and probably always will be (if it gets new submarines). Submarines suit Russia’s strategic situation and requirement to defend against seaborne threats to its continental theaters. Klimov makes the valid point that Russia will need new weapons and systems for a true fifth-generation submarine. To put older ones into a new hull is to “lay down a growing lag” in the fleet, as he says. But, from Moscow’s perspective, curtailing sub production risks falling out of the business altogether. Its industrial base for submarines isn’t doing well enough to take time off. But Klimov’s article is Russian military journalism rarely seen over the past five years or so. He has dared draw conclusions (e.g. the failure of efforts to modernize aging third-generation boats) we haven’t heard from others. What follows is a translation of Maksim Klimov’s October 22 article in VPK. He writes frequently on naval issues. There’s a lot to think about here. Watch for Part II. In recognition of Navy Day several weeks back, Mikhail Khodarenok examined the current state of the Russian Navy for Gazeta.ru. Khodarenok offers a pessimistic assessment of the navy’s shipbuilding program. He notes there is still significant disagreement over what to build. The navy, he argues, has also lost some of its bureaucratic heft when it comes to planning for shipbuilding as well as for the operational employment of naval forces. Late of Voyenno-promyshlennyy kuryer, Mr. Khodarenok — you’ll recall — is an ex-General Staff officer and serious military journalist. He shares interesting and credible opinions from several well-placed former naval officers in his article. According to him, all observers agree that the start of serial construction of ships after more than 20 years is “one of the most important vectors of the fleet’s current development.” This might seem obvious, but it’s not widely appreciated. Khodarenok doesn’t dwell on these points, and his general themes are of greater interest. According to Khodarenok, Pepelyayev feels there is light at the end of the tunnel for the navy, but it’s dim and flickering because navy ship construction “fully reflects the realities and condition of the Russian shipbuilding industry,” and not just shipbuilding. Turning to the sore point of gas turbine engines, Khodarenok writes that Rybinsk may well be able to make them for the Russian Navy by 2017-2018, but someone still needs to replace the reduction gears also once made for navy ships in Ukraine. This is a more difficult task. 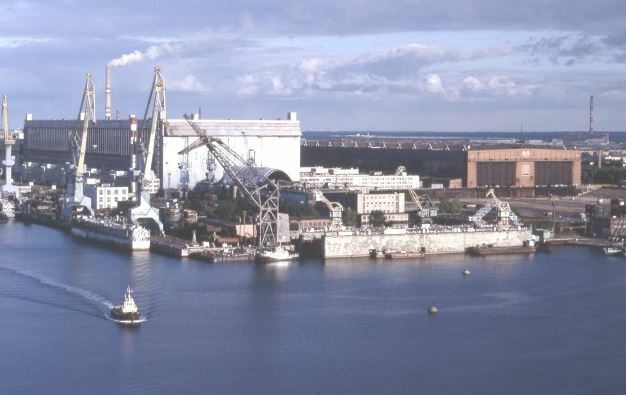 The Zvezda plant in St. Petersburg has gotten the job. Retired Rear-Admiral Yuriy Gorev, who was involved in ship acquisition, tells Khodarenok that the navy should continue building corvettes and frigates while continuing development of Lider. But the new destroyer shouldn’t be a goal of the fleet’s near-term plans. Recall that MOD armaments tsar Yuriy Borisov said an aircraft carrier contract won’t be signed until late 2025, and there are three existing “not bad” designs for it. Former chief of the naval “direction” (department, i.e. not a major bureaucratic entity) of the General Staff’s Main Operations Directorate (GOU), Rear-Admiral Arkadiy Syroyezhko believes there are no insurmountable obstacles to the construction of a nuclear-powered strike carrier in Russia. He thinks Sevmash could handle the job since it was originally conceived as a yard for major surface combatants and later concentrated on submarines. But Syroyezhko admits, without preparation to support carriers, Russia could end up with extremely expensive, sporadically constructed carriers. Today, he concludes, Russia is able to fulfill combat missions typically placed on carriers by other means. Changing gears, Khodarenok covers the state of play in the Russian Navy’s Main Staff. According to him, specialists unanimously report that the operational-strategic component has disappeared from the Main Staff’s work. It no longer plans for the fleet’s employment — for strategic operations in oceanic theaters of military operations. The naval planning job has gone to Russia’s operational-strategic commands (military districts) and the four geographic fleets (as the operational-strategic large formations of those MDs). A Main Staff source tells Khodarenok that the MD commanders have come up with disparate rules for directing the fleets subordinate to them. The source says the disappearance of a naval component in GOU planning began with the downgrading of the GOU’s naval directorate to a “direction,” and with the concomitant reduction in the quality of its naval staff officers. Khodarenok writes there is confusion today over what ships to build, how many, what tactical-technical capabilities they should have, and what missions they should perform. The Navy CINC has “no rights” but many demands made of him in this regard. The Navy CINC’s responsibilities for procurement intersect with those of the MOD’s state defense order (GOZ) support department. It’s unclear exactly where their respective authorities begin and end. The Main Staff source says all sorts of nonsense result from the confusion. Still, the CINC has to answer for almost everything that happens in the fleet, according to Khodarenok. The Navy Main Command’s (Glavkomat’s) move to St. Petersburg was a big mistake, but a return to Moscow would be equally disruptive. A Glavkomat source tells Khodarenok, as long as the leadership sends people to Vladivostok or elsewhere twice a week over the littlest issues, it really doesn’t matter where the headquarters is. It’s tighter in Sevmash’s construction hall, but there’s still plenty of space. For the realization of the state arms program and effective construction of modern nuclear submarines, buildingway-delivery production is being organized at Sevmash. The Testing and Order Delivery Directorate (UISZ) is joining Sevmash’s two largest buildingway departments — 50 and 55. The new structure is needed to increase the tempo of modern nuclear submarines construction (recently a significant number of submarines was laid down), guarantee evenness in labor force distribution, and promote the transfer of production experience. 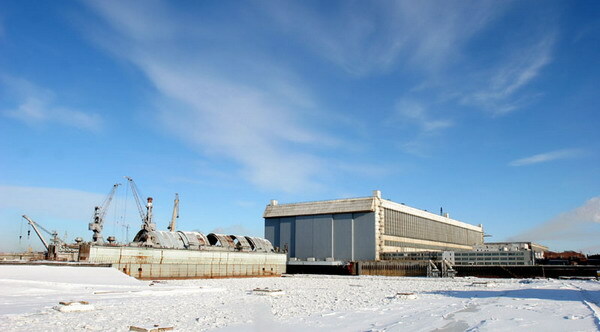 Recall that the buildingway of department 50 was occupied with civilian production in the 1990s: specifically, it built the unique ice-resistant maritime platform ‘Prirazlomaya.’ Last year the department came back to its core business: modern nuclear-powered submarines were laid down here. As the chief of buildingway-delivery production Sergey Novoselov announced, a management system for the new large-scale sub-unit is currently being formed in accordance with the general director’s order. For curiosity’s sake, here’s Bellona.org’s take on the ‘Prirazlomaya’ drilling platform. Not flattering. What is this buildingway-delivery production? It sounds like Sevmash knows once it launches some submarines now under construction, it’ll face a fitting-out bottleneck . . . perhaps some pre-delivery work will now occur on the ways prior to launch. Various media outlets recently noted Russia’s increased submarine production and declared that it is building four nuclear-powered boats (two SSBNs and two SSNs) for the first time in post-Soviet history. Examples can be found here and here. But a bit of research, e.g. here, here, here, and here, would have shown that three SSBNs and four SSNs — seven unfinished boats — are now in the hall at Sevmash. Six laid down since 2012. They are, of course, proyekt 955A Borey-class SSBNs and proyekt 885M Yasen-class SSNs. Official reports from Sevmash early last year indicated that the builder plans to lay down two more Boreys and two more Yasens in 2015. That would make a rather whopping 11 submarines under construction. The numbers seven and 11 hark back to the halcyon days of Soviet production: to the 1980s when Sevmash built Typhoon-, Delta IV-, Oscar-, and Akula-class submarines. Early in that long ago decade, Moscow built four boats at a time, toward mid-decade — six or seven, by the time Gorbachev came to power — eight, before 1990 as many as 10 simultaneously. Then production dropped to virtually zero in the mid-1990s. We should remember, however, that Russia’s submarines under construction could turn out to be proverbial “birds in a bush.” The navy much prefers to have completed boats in hand. So what stands in the way of completing them? A number of things potentially. Skilled labor, materials, and component shortages, finding domestic substitutes for sanctioned foreign inputs, and high interest rates and high inflation complicate the already pricey business of building new submarines. This news is dated, but wasn’t picked up widely (if at all). Russia will start construction on eight nuclear-powered submarines in 2014-2015, according to the chief of Sevmash. In 2015, Russia will lay the first sections of two Borey-class nuclear-powered ballistic missile submarines (SSBNs) and three Yasen-class attack submarines (SSNs), Sevmash General Director Mikhail Budnichenko told ITAR-TASS on 7 February. Speaking at Defexpo 2014 in New Delhi, Budnichenko indicated that Sevmash will begin construction on two Borey SSBNs and one Yasen SSN in 2014. The Borey SSBNs will be modernized Proyekt 955A submarines, reportedly stealthier than the first three Proyekt 955 boats. The Yasen SSNs will be improved Proyekt 885M submarines. If Russia keeps to the schedule outlined by the Sevmash chief, it will put all remaining units of eight planned Borey SSBNs as well as seven Yasen SSNs into build. The total number of Yasen-class submarines has been reported at six or seven at various times. They would include Severodvinsk (Proyekt 885) and either five or six Proyekt 885M boats. Just before Christmas, RIA Novosti took a cut at identifying the big military stories of 2014. Acceptance of proyekt 955 Borey-class SSBN Vladimir Monomakh. That’s unit three. RIAN also puts five pending Bulava SLBM launches, including from Monomakh, on its list. Acceptance of the lead unit of proyekt 885 Yasen-class SSN Severodvinsk. Construction of a new National Command and Control Center for State Defense. Acceptance of the Ratnik future soldier system. One-Time Monetary Payments (or YeDV) for servicemen owed permanent apartments. It’s supposed to end the housing line forever. Flexible pricing in the State Defense Order. Starting in 2014, some contracts may be for a fixed price while others will be figured on what was actually spent to produce end items. Formation of an aerobatic flying group with new Yak-130 trainers. State acceptance testing for the T-50 / PAK FA. Continued, gradual rearmament to the level of 30 percent modern weapons and equipment in all forces. Formation of 16 new medical companies (to expand to 50 over the next 18 months). A special mobile medical (medevac) brigade will be formed in each military district. Conscripts from reestablished sports companies slated to compete in the Olympic Winter Games in Sochi. By way of context, here’s what RIAN predicted for the big stories of 2013: end of explosive destruction of old munitions, Bulava / Borey / Yasen, Vikramaditya [ex-Gorshkov] handover, Putin’s promise to end the military’s housing problem, Shoygu’s pledge to turn MOD property matters over to Rosimushchestvo, Armata tank and related platforms, T-50 / PAK FA testing, creation of Concern “Kalashnikov” and the new AK-12, the Russian DARPA — Fund for Future Research, Oboronservis criminal cases in court, and Zapad-2013. Interesting to consider how much (or how little) movement occurred on these issues last year.